Today is 27th anniversary of ADA – Americans with Disabilities Act. On the photo above is me giving a presentation last year about accessibility at a local event that happened to be on the anniversary of ADA. 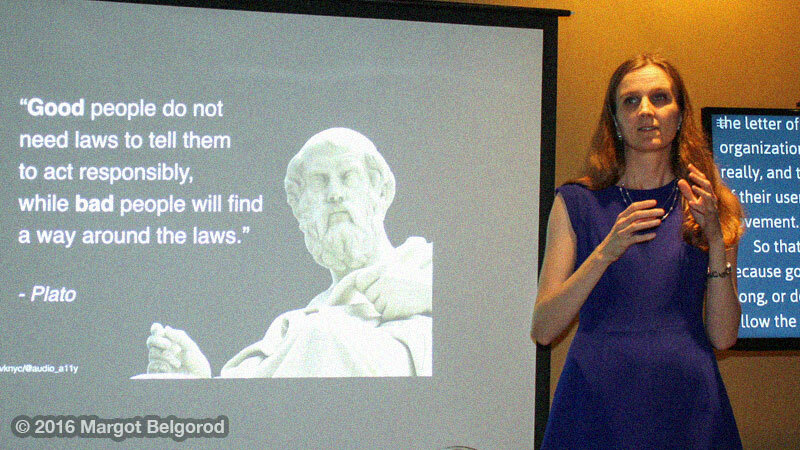 The slide on the photo says: “Good people do not need laws to tell them to act responsibly, while bad people will find a way around the laws.” It’s Plato’s quote and my favorite. Why is Plato’s quote my favorite and how does it apply to the disability law? The reason the law was passed is to mandate businesses to make their products, services, events accessible. Despite people with disabilities making up the largest minority, their needs are still ignored, even now with the law being around for so long. People with disabilities make up one billion people, or 15% of the world’s population – according to The World Bank. Many think that you can be disabled only at birth or at an old age, but disability can happen at any time to anyone. Disability doesn’t discriminate anyone. For example, I was born with normal hearing to hearing parents, but I lost all of my hearing after contracting meningitis and fighting for my life for 2 weeks. I was not aware about the ADA law or my accessibility rights until after I started attending an American college. While we are still fighting for accessibility even 27 years after the passage of the law, I’m impressed with how ahead USA is in the terms of accessibility compared to many other countries. As someone who was born and raised in another country, I had to go through lots of hurdles to get where I am now – for example, attending mainstream schools without formal communication access services, learning English as my third language in regular classes, growing up without TV captioning until high school, and so on. To make the world accessible, I personally think that increased awareness and empathy make more sense. Some non-disabled people may simply not be aware of accessibility needs or not sure how to meet the needs of people with disabilities the right way. Laws may help people with disabilities and enforce organizations, but not unless more people understand what it’s like to have a disability in the inaccessible world, they are not willing to remove barriers. Removing physical barriers is easy, but removing attitudinal barriers is the hardest part. Some people may just need a guidance to improve accessibility while others sadly need to be forced – that’s why laws are created. It’s great that more organizations like Apple, Google, Microsoft, and other organizations becoming more considerate about accessibility. I can now watch many movies in iTunes and TV shows in Apple apps with good quality captions – just a decade ago there were a few if any accessible movies in iTunes and I could watch captions only on TV, but not online. Yet there are still many organizations who are still behind in terms of accessibility or use it only as an afterthought. While I’m glad that I’m able to attend more events that are accessible to me and other attendees with disabilities, there are still many events whose organizations turn down my request for communication access services. Ironically, there are some diversity related events that are not accessible at all to attendees with disabilities and rarely if ever disability and accessibility are mentioned in topics about diversity. People with disabilities sadly still face problems with employment. Despite having great skills and education, 70% of them are unemployed or unemployed and are often passed over by non-disabled people who may have less skills than them. Even if people with disabilities are employed, they often experience discrimination. For these reasons, they often hide their disabilities. More schools and universities are accessible to students with disabilities, but many students and their parents are still fighting for accessibility. Not all are even aware of their rights to reasonable accommodations or realize that they should not accept substandard services. I’ve heard complaints from many deaf students who are frustrated with less qualified interpreters or captioners because many universities want to save money and assume that they are already complying with the law by hiring whoever can provide communication access services and do not consider quality. When talking about accessibility, many businesses think that just following a checklist is good enough. However, it’s more than just following the letter of the law. There are many situations that certain types of accessibility may not be considered reasonable. For example, just turning on auto captions in your video doesn’t solve accessibility problems – auto captions are not of acceptable quality and need to be made by a human. Same goes to hiring good quality sign language interpreters and live captioners for events to ensure smooth communication. It would be great to see more organizations consider accessibility as part of any products and services from the beginning and not as an afterthought or a separate thing for “just a few”. Accessibility is universal design and benefits everyone and not just those with disabilities. For example, wheelchair ramps benefit parents with baby strollers, captions benefit listeners who have difficulties understanding speakers with accents, audio books benefit drivers traveling long distances, and so on. Today’s anniversary reminds us that even though many things have improved for which we are very thankful, there is still a lot of work to improve accessibility. It also reminds us about the long and hard fight that people with disabilities have had for years. Only in the barrier-free society people with disabilities don’t feel disabled. For example, wheelchair users won’t feel disabled if they can easily use stairs with ramps and elevators. Blind people won’t feel disabled if they can easily follow text by listening to voice over and/or using Braille print. Deaf people won’t feel disabled if they can easily follow aural information through captions and easily communicate via sign language or in better listening situations. Let’s make the world more accessible! Do you want to learn more about accessibility and to have an experienced deaf professional give a workshop / training to your organization or speak at your event / conference? Contact me!